This 8-foot by 40-foot mural was commissioned by a couple in the South Valley for a stucco wall that stretches along the property at 1152 Tapia Blvd SW. The mural combines a background abstracted by the colors and flowing shapes from The Dance by Henri Matisse and is overlaid by images of dancers from a variety of cultures. 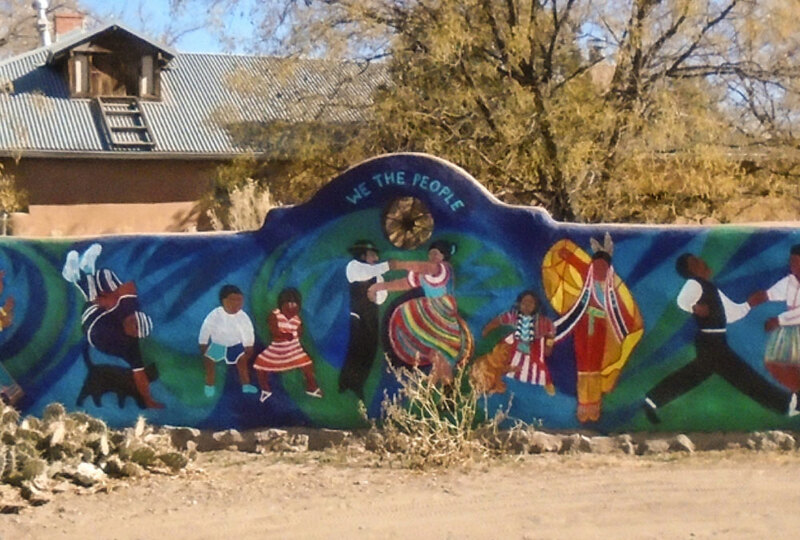 Denise Weaver Ross has completed two previous murals: Garden of the Muses located in The Source’s Community Garden on Carlisle SE, and We the People on Tapia Road in the South Valley. In 2017, she was featured as the poster artist for ¡Globalquerque!’s world music festival. Weaver Ross is well known for her House of Cards series, and in the past five years she has exhibited in national juried exhibitions in Attleboro, MA; Las Vegas, NV; Albuquerque and Santa Fe. She has designed a mural for 2018 Mural Fest for Tortuga Gallery. Her work can be seen regularly at Ghostwolf Gallery in Old Town, and she has a one-person show scheduled for October at Tortuga Gallery.